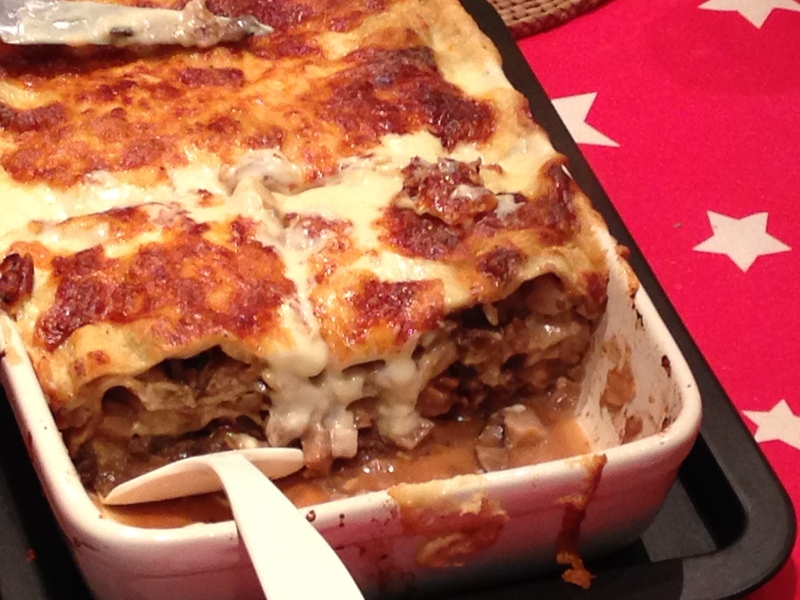 For my vegetarian Christmas celebration, I opted for one of my favourites – lasagne, this time made with rich layers of mushroom, herby celeriac and creamy cheese sauce, along with the obligatory home made pasta sheets. Of course you could use shop bought pasta, but making your own is really simple. It’s a 3 pan, 1 dish meal so can be a bit of a faff to prepare, but the great advantage is that you can make it in advance. It freezes well uncooked, or can be made a day of so and left in the fridge. Just prepare to the point of baking and set aside until needed, throw it in the oven and you’re away. What better way to entertain your guests with a sumptuous meal? Celeriac has a really strong flavour, and not everyone gets on with it. I’d consider doubling up on the mushroom layer volumes and missing out the celeriac layers completely for a truly intense mushroom lasagne variant. In a pan, heat the olive oil and sweat off the chestnut mushrooms and garlic with the thyme.